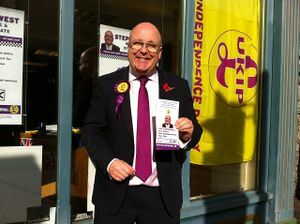 UKIP candidate Stephen West campaigning in Newport, Isle of Wight for Hampshire Police & Crime Commissioner in 2012. The United Kingdom Independence Party, also known by the acronym UKIP (pronounced "you-kip", its followers affectionately known as "Kippers"), is a conservative and Euroskeptic political party in the United Kingdom. Founded in 1993, it campaigns for British withdrawal from the European Union (EU). Its support-base is made up substantially of social conservative, traditional conservative and libertarian voters who are opposed to the surrender of British sovereignty. The party was dominated by Nigel Farage, who served on-and-off as party leader from its creation until 2016. Prior to the 2016 Brexit referendum, it was also one of the fastest-growing British political parties; according to a YouTube interview with Farage in May 2015, the party has 47,000 members. UKIP's top goal, of leaving the EU, was achieved when the British people voted to leave the EU in a referendum held on June 23, 2016. Former UKIP leader Nigel Farage is arguably the most successful British politician of the modern age for successfully advocating and then winning a referendum for leaving the EU. He noted in 2017 that Conservative Party Prime Minister Theresa May had adopted the exact same political positions as he had a few years earlier. Nigel Farage in 2008. Farage successfully supported taking Britain out of the EU, and he supports limiting immigration, small government, and British sovereignty. Under the leadership of Nigel Farage, UKIP broadened its political agenda. It now has policies on tax, defence, the health service, education, electoral reform and constitutional reform. UKIP attracts alienated voters especially on the right who are critical of the centralized and undemocratic structure of the EU. UKIP has endorsed a British centre-right economic agenda. It proposes a flat tax and opposes national identity cards. It is sceptical of the more extreme claims of AGW and critical of carbon-permits and other EU environmental policies as economically and environmentally harmful. UKIP opposes laws restricting freedom of speech, including on the internet. In 2017, UKIP added banning the burqa and Sharia Law to its agenda. UKIP is frequently accused by the establishment and leftists of being a "racist" party and is associated with racist parties by the liberal media, such as the politically correct TV networks (such as the BBC) and newspapers (such as The Guardian). Most claims of UKIP being "racist" are defended by pointing to a couple of minor disgraced UKIP councillors or party members – these people have often been expelled from the party. UKIP membership is in fact open to all, regardless of ethnic origin, and in the 2010 and 2015 elections, UKIP fielded a significant number of candidates who are members of ethnic minorities. In the 2008 European elections, UKIP came second, with 16.5% of the vote and 13 of the UK's 78 seats in the European Parliament. In the Parliamentary election of May 6, 2010, UKIP got 3.1% of the vote, a total of 917,232, an increase of 50% on the previous parliamentary election vote. However, owing to the electoral system, they still did not receive any MPs; therefore, the party is fervently in support for proportional representation, forging an unlikely alliance with the Green Party of England and Wales (an eco-socialist party) and the Liberal Democrats (an allegedly centrist party, although a significant proportion of its policies come from the social democratic – i.e. socialist – trend). UKIP has 2 members in the House of Lords. In 2013, UKIP achieved a milestone in the local elections when 147 councillors were elected across the UK adding to the 50-60 councillors that were already in place. The 2014 European Parliament elections were a milestone for UKIP, as the received 27.49% of the vote as well as 24 seats, making it the largest UK party sitting the EU parliament, both in popular votes and seats, even larger than the Conservative and Labor parties. Despite claims that UKIP was a "protest vote" in the European elections due to their avid euroscepticism, UKIP won 12.9% of the popular vote in the 2015 General Election in the United Kingdom. However, due to the inconsistent electoral system in the United Kingdom, they received just 1 seat out of 650. It has less than 500 councillors out of 20,000 and 3 (out of 780) members of the House of Lords. Under a system of proportional representation, UKIP would have 82 seats, instead of just 1. The party's support sharply fell after the successful Brexit referendum in 2016, with most of its voters returning to the Conservative Party. ↑ Armstrong, Paul (July 15, 2016). Nigel Farage: Arch-eurosceptic and Brexit 'puppet master'. CNN. Retrieved October 4, 2016. ↑ BuzzFeed: Nigel Farage ‘Britain’s Most Successful Politician in a Generation’. Breitbart. June 24, 2016. Retrieved December 29, 2016. ↑ Deacon, Liam (July 3, 2018). Article 13: UKIP Joins Pro-Free Speech #SaveTheInternet Fight, Forces EU Parliament Vote. Breitbart News. Retrieved July 3, 2018. ↑ Deacon, Liam (April 23, 2017). UKIP Promises to Ban the Burqa and Sharia Law. Breitbart News. Retrieved April 24, 2017. Deacon, Liam (May 4, 2018). Local Elections: UKIP Suffers Wipeout as Corbyn’s Labour Stalls. Breitbart News. Retrieved May 4, 2018. Jasper, William F. (May 4, 2018). UK Elections, Brexit Sabotage, UKIP’s Collapse. The New American. Retrieved May 4, 2018. Delingpole, James (May 4, 2018). Delingpole: The UKIP/Black Death Story Is Classic SJW Dirty Tricks. Breitbart News. Retrieved May 4, 2018.